Urgent message: Quadriceps tendon tears are misdiagnosed frequently, leaving patients at excessive risk for long-term disability. Early identification and immediate referral for further care—often, surgery—is necessary for optimal outcomes. Musculoskeletal injuries are among of the most common problems seen in the urgent care setting. Quadriceps tendon tears are uncommon injuries, with an incidence of approximately 1.4/100,000 per year. Consequently, misdiagnosis is common—reportedly as high as 50% in some clinical settings.1-3 Missed or delayed identification may result in long-term disability, especially when the tear is complete.1,3,4 A working knowledge of knee anatomy is important in understanding the various clinical presentations, and a high index of suspicion is crucial in making the correct diagnosis. A 55-year-old male arborist was injured while digging a hole for a tree. He missed kicking his shovel and struck the ground with his left foot. He immediately felt pain about his knee and was unable to bear weight on his left leg. That evening he was seen in a local emergency department for knee and leg pain. He was subsequently diagnosed with a quadriceps strain and sent home with narcotic pain medications and advised to follow-up with orthopedics if his pain continued. The following day, his employer was concerned about his inability to work and arranged an appointment in the occupational medicine clinic for further evaluation and management of work restrictions. The patient noted the presence of knee pain, as well as inability to bear weight on and to completely straighten his left leg. Physical examination revealed mild-to-moderate swelling and edema in the distal quadriceps proximal to the patella. The patient was not able to extend his left knee against gravity. Additionally, he had evidence of extensor lag (diminished or absent active extension with intact passive extension) while attempting to hold the leg at full extension in a seated position. 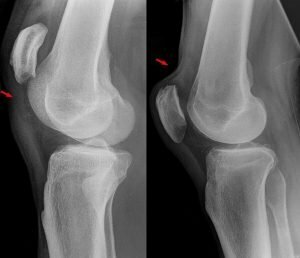 A subtle but palpable defect was noted along the lateral quadriceps tendon, roughly 2 cm proximal to the patella. A three-view x-ray with sunrise views of the knee did not show anatomical abnormalities. The differential diagnosis included osteochondritis dissecans (OCD) of the patella, patellar dislocation or fracture, patellar tendon rupture, prepatellar bursitis, quadriceps contusion, and quadriceps strain. Based on physical findings, it was believed he had a quadriceps tendon tear. He was placed on non‒weight-bearing restrictions, his knee was placed in an immobilizer, and he was given a pair of crutches. He had a same-day appointment with an orthopedic surgeon, and a magnetic resonance imaging (MRI) study was performed. The MRI showed a nearly complete tear of the quadriceps tendon. A week later, he underwent surgical repair of the quadriceps tendon and then began a rehabilitation program. Common presenting signs and symptoms include acute knee pain, swelling, palpable quadriceps tendon defect, extension difficulty, and an inability to bear weight.3,5 Inability to fully extend the knee and/or a palpable suprapatellar gap should suggest a complete tear.3,4 Patients often have no preceding history of knee pain. Figure 3. Quadriceps tendon complete tear with an avulsed patellar fragment. Partial quadriceps tendon tears tend to occur in younger patients, particularly those involved in athletics, while complete tears tend to occur in adults aged 40-60. The commonly described mechanism of a quadriceps tendon tear is indirect trauma with rapid eccentric contraction of the quadriceps muscle on a planted foot with a partially flexed knee, such as trying to catch oneself with an outstretched leg while falling. The inability to fully extend the knee and/or a palpable suprapatellar gap are strongly suggestive of a complete quadriceps tendon tear. Partial quadriceps tendon tears can be managed conservatively, while complete quadriceps tendon tears require early surgical repair (1‒2 weeks post-injury) to avoid decreased functional outcomes and less successful surgical management. Ciriello V, Gudipati S, Tosounidis T, et a. Clinical outcomes after repair of quadriceps tendon rupture: a systematic review. Injury. 2012;43(11):1931-1938. Lee S, Song E, Seon J, et al. Surgical treatment of neglected traumatic quadriceps tendon rupture with knee ankylosis. Knee Surg Relat Res. 2016;28(2):161-164. Hak DJ, Sanchez A, Trobisch P. Quadriceps tendon njuries. Orthopedics. 2010;33(1):40-46. Ristic V, Maljanovic M, Popov I, et al. Quadriceps tendon injuries. Med Pregl. 2013;66(3-4):121-125.